High winds caused the 40.5 metre superyacht Serque to break free from her mooring and be washed onto a beach in the Bahamas near Staniel Cay. The custom yacht built by US yard Broward was anchored off of Big Major Spot in the Exuma island chain of the Bahamas where she was pushed all the way to shore. The anchorages in the Bahamas tend to be shallow and grounding is always a possibility if low tides aren’t minded, but getting washed to shore is less common. Serque has a draught of 2.44 metres. The popular anchorage of Big Major Spot is famous for its family of wild, but friendly, swimming pigs who inhabit the island. The pigs can be seen in the background of the photos of the Serque washed ashore. Fortunately, it was reported that Serque was able to freed and floated off the hard a few hours after the photos in this story, courtesy Butch Hampton, were snapped and she is currently being salvaged. Serque is an aluminium-constructed displacement yacht that was completely rebuilt by her former owner in a three-year process and re-launched in 2009. Exterior design comes from Donald L Blount and Associates and interiors are by Pavlik Yacht Design with joinery by Genesis Yachtline. 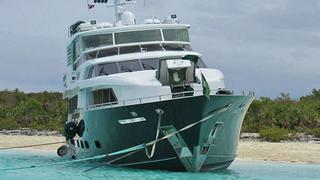 She accommodates 12 guests in four double and two twin cabins and has space for six crew members.